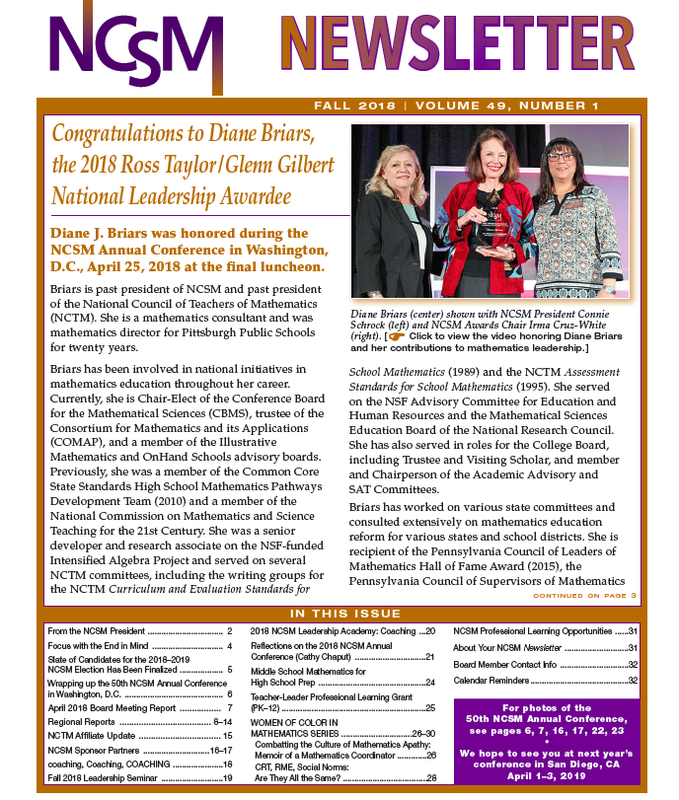 The Fall 2018 NCSM Newsletter is Available Online Now! The Fall Issue of the Newsletter has been posted to the NCSM website. Click HERE to access this current issue online or click on the image of Fall 2018 NCSM Newsletter shown below. Registration for the two NCSM Fall Seminars is open! November 28, 2018 in Seattle, WA at the Renaissance Seattle Hotel, 515 Madison Street, Seattle, WA. Registration for the Hartford Fall Seminar (October 4) can be accessed by clicking HERE. Registration is now open for the 2019 NCSM Conference in San Diego, April 1-3, 2019! Drs. Andre Denham (The University of Alabama College of Education) and Kristin Harbour (The University of South Caroline College of Education) are requesting participation in a brief survey. This survey seeks to determine if mathematics teachers are using digital games in the classroom, and if so, how are they using them. They are also trying to determine the barriers to using digital games in the mathematics classroom. Responses to this survey will help us better understand how, when, with whom, and under what conditions mathematics teachers are using digital games. This will provide us with further insights into the practical use of digital games in mathematics instruction, give further insights into strategies to better assist mathematics teachers who are using digital games, and support mathematics teachers who are not using digital games but are interested in doing so. The survey is brief and will only take about 15-25 minutes to complete. Please click the link below to go to the survey (or copy and paste the link into your web browser). The survey link will be open through September 30, 2018. Your participation in the survey is completely voluntary and all of your responses will be kept confidential. No personal identifiable information will be associated with your responses to any reports of these data. The University of Alabama Institutional Review Board has approved this survey. Continue to tune into the activites for the Collective Call to Action - Equity and Social Justice in Mathematics Education: From Awareness to Action. The next discussion forum for September/October will culminate with a webinar in November 2018 (date TBD). 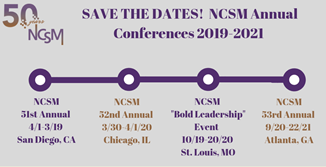 NCSM is moving our annual conference to the fall starting in 2020. We have been asked several questions via email about what NCSM has planned for the year of the change. To keep everyone in the know, I want to share with our members the current plans. We will be hosting the NCSM 52nd Annual Meeting in Chicago, IL, March 30-April 1, 2020. Our current 2nd VP and conference committee are hard at work already planning for this event. During the fall of 2020, NCSM will host a special event preceding the NCTM Annual Meeting in St. Louis, MO. We have already began drafting plans for a “bold leadership” event so be sure to save the date, October 18-20, 2020 for this event in St. Louis. Starting in 2021, we will move the annual conference to the fall. We will host the NCSM 53rd Annual Meeting in Atlanta, GA September 20-22, 2021. I also wanted to update everyone on the NCSM Board work at our annual strategic planning meeting this past summer. We have updated our initiatives for the next three years, 2018 – 2021. These initiatives are designed to focus our work around what it takes to bring our mission and vision to life. The initiatives are designed to serve our membership in multiple ways and below is a brief description of each initiative. You can read more details about each initiative on our website by clicking HERE. Initiative: Equity and Access in Action - The Equity and Access in Action Initiative has been established to build on the past initiative’s work of creating and promoting a common understanding around equity. We hope to broaden the conversation to include access and to provide tools that will help leaders take actions in order to increase equity and access in the classroom. Initiative 2: Leadership Learning - The Leadership Learning Initiative has been updated to provide professional resources and supports for mathematics leaders at all levels. The major goal is to provide current research-affirmed resources for all mathematics leaders, starting with a focus on site-based leaders, coaches, and teacher leaders. This initiative will further support all mathematics leaders through a combined revision to the current NCSM publications, PRIME and It’s TIME. Initiative: Communication Exchange - The Communication Exchange Initiative focuses on effective global communication and sharing the mission and vision of NCSM, the premier mathematics education leadership organization. 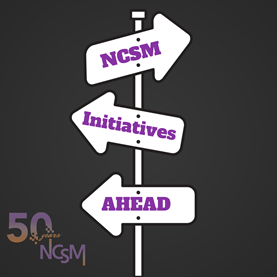 This initiative will support continued growth, branding, and promise of bi-directional feedback and feed-forward communication between NCSM and members. This initiative will also connect all of the initiatives and projects through the use of technology that will ultimately define our organization. Voting for the NCSM Election is Now Open! If you are a current member, you received a postcard in the mail with voting instructions and your voter code. Go to the NCSM website, mathedleadership.org or by clicking HERE to begin the voting process. Voting is now open and will end on October 15th. The following NCSM awards are opened for nominations now. Consider nominating that special mathematics leader who inspired you and is the reason you yourself are a mathematics leader today. Please note the deadline for each award or grant. As shared last month, there will be a video introduced here each month to highlight the benefits as found on the NCSM website (https://www.mathedleadership.org/). 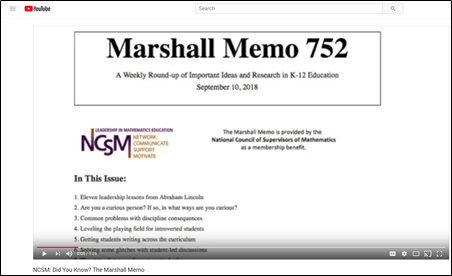 The video tour for this month, created by Shawn Towle (Eastern 1 Regional Director), features the Marshall Memos sent out each month via NCSM email and available through the website. Click HERE or on the YouTube image below to access this month's tour. Look for another video tour next month in the eNews.